As a principle, the rule of law seeks to recognise the supremacy of the law. It is based on the simple premise that no one should be above the law. The international community acknowledges the rule of law as a precursor to the successful promotion of development and democracy, and respect and adherence to it is recognised by Commonwealth governments as a fundamental Commonwealth value. A well-functioning democracy is not possible without the rule of law. This is because the basic elements of democracy, such as free and fair electoral systems, respect for human rights, and a vibrant and participative civil society, are all underpinned by the rule of law. In post-conflict societies, rebuilding and reconciliation often begin with the restoration of the rule of law to enable the fragile political process to begin. An environment premised on a strong respect for the rule of law will, in turn, promote and foster economic and human development. This is because the institutions of governance based on the rule of law will help to promote social stability and legal certainty. Legal certainty means that investors, particularly foreign investors, can feel safe and confident to enter the market and can assume risk that forms the basis of a market economy development. Lack of investment will slow economic growth and deny government the revenue to invest in education and social safety nets that are critical for sustainable development. In recent years, the international community has intensified its support for an all-inclusive interpretation of development. This is rightly so because it is clear that the objective of any society seeking political or social advancement and economic progress is human development. The interdependency of these elements of development is therefore not in doubt. This makes it imperative to develop a comprehensive process to achieving broad-based development. Developing sound legal frameworks will necessarily form part of this process as these are prerequisites for economic growth and social advancement. A comprehensive legal and judicial reform agenda can make an important contribution to the overall process of development. Consistent and effective laws and reliable legal tools must exist in order to address social injustice or economic imbalances. Also important is a stable and predictable legal system which promotes confidence in parties to enable protection of property rights and effective enforcement of contractual rights. Since the onset of globalisation and establishment of the UN’s poverty-reduction targets, the Millennium Development Goals (MDGs), the Commonwealth Secretariat has renewed its efforts in helping countries to develop many legal frameworks to help them become credible trading partners, fulfil their international legal obligations as well as development goals and develop poverty reduction strategies through, for example, strengthening access to finance through leasing for micro and small enterprises. For Commonwealth member countries, the rule of law is fundamental to fostering democratic and accountable governance, and the Secretariat’s Programme on the rule of law seeks to support member countries to address the challenges they face in their effort to develop and maintain effective and accountable governance. The programme, which is comprehensive in nature, is led by the Legal and Constitutional Affairs Division (LCAD). The LCAD plays a supportive and facilitating role to Commonwealth member countries in upholding the rule of law. It primarily undertakes legal, judicial and constitutional reform to protect and promote the rule of law. Specific areas of focus and priority have been driven by specific concerns of Commonwealth ministers and Heads of Government. These include intellectual property law, which arose from the need to assist countries to fulfil their obligations under multilateral trade agreements such as the World Trade Organization (WTO) agreements. Other related areas include the abuse of intellectual property rights (IPR) through the production and distribution of counterfeit and pirate goods, which has attained such magnitude that the global market is estimated at US$200 billion by the Organisation for Economic Co-operation and Development (OECD). Examples of counterfeit goods include baby foods, toys, cooking oil and pharmaceuticals. Examples of pirate goods are illegally reproduced and often substandard CDs and DVDs and the free download of copyrighted music and movies; the growth of these pirate goods has seen a corresponding significant decline in the once-vibrant entertainment industry in some countries. Moreover, fake goods are produced with substandard and sometimes dangerous materials that represent a danger to public health and safety; and because they are sold cheaply, they kill the market for bona fide goods, whose production ultimately ceases. Fake and pirate goods are also smuggled into countries, depriving governments of much needed revenue. Further, the resulting profits are used to fund organised crime and this can impact on public order. These are some of the concerns influencing the Commonwealth initiative on IPR enforcement. The Rule of Law Programme has enabled the Secretariat to assist countries in developing stronger enforcement mechanisms, which (among others) has seen IP offences criminalised. Under these mechanisms, those manufacturing and distributing fake goods can be prosecuted. Also, profits made from these activities (as well as other assets acquired from trading in fake goods) can be traced, seized and confiscated. The mechanisms developed seek to protect creators so that they are able to reap the benefits of their work. The case studies provided cover a variety of areas and illustrate the impact of the abuse of IPR on society. LCAD is also involved with the Heavily Indebted Poor Countries (HIPC) Initiative. Its involvement arose from the concern that the debts of developing countries, especially those already classified as poor countries, had reached unmanageable proportions. The concerns resulted in calls for the forgiving of those debts as there was no obvious means of repayment by the debtor countries. Also, at a time when countries were committing to poverty reduction as part of the fulfilment of the MDGs, such states of affairs were incompatible with the objective of the MDGs – forgiveness of these debts was seen as a fundamental part of the fulfilment of the MDGs. Meanwhile, some hedge funds had developed an unpalatable practice by purchasing sovereign debt at significantly reduced rates and attempting to enforce their contractual rights in court for the full value of the debt with interest. On occasions, the resulting judgments crippled the economies of debtor countries. The objective of the related LCAD programme is to assist countries facing litigation or threat of litigation from private investors. In this regard, a Legal Referral Clinic was established to assist countries in the renegotiation of the debt owed to the private investors. Countries have also been encouraged to adopt laws on fiscal responsibility in order to avoid the accumulation of overwhelming debt. The Clinic underpins the Secretariat’s HIPC initiative and its efforts to help countries fulfil the MDGs. The Commonwealth holds over one-quarter of the world’s population and one of its unique advantages is the commonality in the legal systems of its member countries. This promotes legal harmonisation, and makes legal co-operation easier and perhaps more cost effective between its members. The framework for Commonwealth legal co-operation is found in the Commonwealth Schemes on the administration of justice. The schemes represent reciprocal arrangements between Commonwealth countries to co-operate within the parameters of their national laws. Assistance can be given in criminal matters, extradition, the return of material cultural heritage and in allowing those convicted in foreign countries to serve their sentences in their home country. Where two or more countries have common peculiarities, the Secretariat can help them to develop a legal framework to cater for their specific needs. Assistance can also be provided to member countries to negotiate similar arrangements with non-Commonwealth countries. It is important to note that the schemes are informal and therefore non-binding arrangements but Commonwealth member countries are to be commended for having the will to enact binding national legislation giving effect to the provisions of the schemes which allows a genuinely mutual assistance. The Rule of Law Programme helps member countries to engage with the rest of the world. The Secretariat plays a key role in the facilitation of such engagement through its representation at various international forums such as the United Nations. It helps to negotiate international conventions on behalf of Commonwealth countries. When those conventions are adopted, countries are expected to ratify and implement them so they become part of their national laws. Some of the important international instruments the Secretariat is working on include the International Criminal Court (ICC) Statute, which deals with the crimes of genocide, crimes against humanity and war crimes. Another is the UN Convention on Anti-Corruption (UNCAC) designed to address the challenges faced by many countries in implementing strategies for achieving transparent and accountable governance. The Secretariat assists in many other ways – for example, by developing legal toolkits, advice and training tailored to the systems of member countries. Because countries are at different development stages, individual needs analysis and assistance are provided under the Commonwealth Fund for Technical Co-operation (CFTC), one of the voluntary funds operated by the Secretariat. This allows the Secretariat to give focused and specific assistance to individual countries based on those countries’ national needs and priorities. Such assistance complements the general and collective work undertaken for member countries. The commonalities in legal systems means that Commonwealth countries can adopt a common position on many legal matters. The Secretariat provides the platform for developing Commonwealth legal policy by organising biennial meetings of senior officials from ministries of justice. This is followed by the triennial meetings of Ministers of Justice, which issue directives on the work to be done under the Rule of Law Programme. The opportunity created by the unique access to high-level officials such as law ministers has contributed to the success of the Rule of Law Programme. This helps to strengthen the political will in member countries to continue to pursue the legal and justice reform work under the programme. Some of the work under this programme has fallen within the primary responsibility of other ministries. An example is the work on HIV/AIDS (Health Ministry), the work on Heavily Indebted Poor Countries (HIPC) Initiative (Finance Ministry), and others such as competition, intellectual property and environment. Such deviation has not diminished the energy and focus of the Rule of Law Programme but is a further indication of the interdependence of the development issues in member countries and the need to co-ordinate, avoid compartmentalisation of the issues, and develop a comprehensive solution to achieving development as embodied by the MDGs. The majority of Commonwealth countries are small states and as small economies the challenges they face are vast, ranging from environmental disasters and diversifying their economies to terrorism – all of which make their economies, and sometimes their very existence, vulnerable. 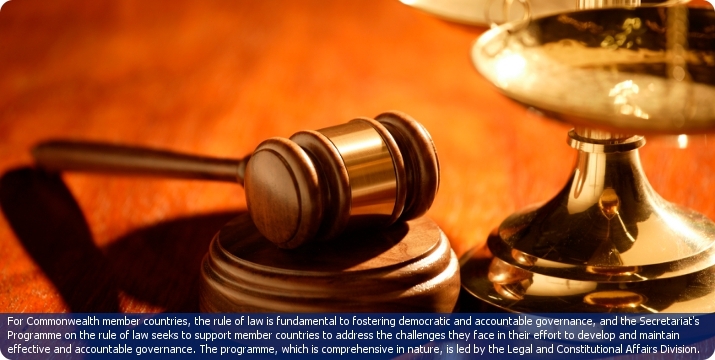 The Rule of Law Programme gives special attention to the legal issues relating to small states. Legal reform tailored to the needs of small states is therefore an important part of the portfolio which takes into consideration their special needs. LCAD organises meetings every two years for ministers of justice from small Commonwealth countries. The meeting is immediately preceded by the meeting of Senior Officials of Law Ministries (SOLM), thus making it convenient and cost effective for officials from small states to attend both meetings if they so desire. The meeting of law ministers of small states provides an important platform to determine matters of mutual interest and to develop a common legal policy based on their shared circumstances. Another platform is provided through the triennial Commonwealth Law Ministers Meeting (CLMM). In delivering its work under the Rule of Law Programme, the LCAD works with a variety of sectors, lawyers, judges, registrars, policymakers, investigators, prosecutors, the police and other law enforcement officials, academics, officials of international and regional organisations, and representatives of civil society. There is a strong reflection of issues such as gender, youth, human rights, environment and health in the Rule of Law Programme which brings a multi-faceted and robust approach to the Secretariat’s work. LCAD has adopted a creative and flexible approach to its work without compromising on quality and effectiveness. It has implemented some of its work online, notably the Commonwealth Law Bulletin, its flagship publication designed to bring awareness of emerging international legal developments. In collaboration with strategic partners, it has developed electronic legal resources available free to researchers and scholars. Other work has been delivered in the form of model laws, strategies, guidelines, action plans and other legal toolkits developed with the objective of supporting countries to fulfil their obligations and accede to international standards. LCAD has also facilitated mentoring, exchange of legal personnel, sponsorship, expert placement and internship, among others. Its work on legislative drafting has been delivered through curriculum development implemented by local educational institutions. It has helped to develop strong professional networks in various areas to strengthen co-operation in criminal justice matters and it encourages lawyers to contribute their time free for the benefit of their communities.